Barnacles and mussels have an intimate relationship, but are they welcome house guests or uninvited squatters? After attaching themselves to the back of a mussel, barnacles benefit from the relationship in a number of ways. 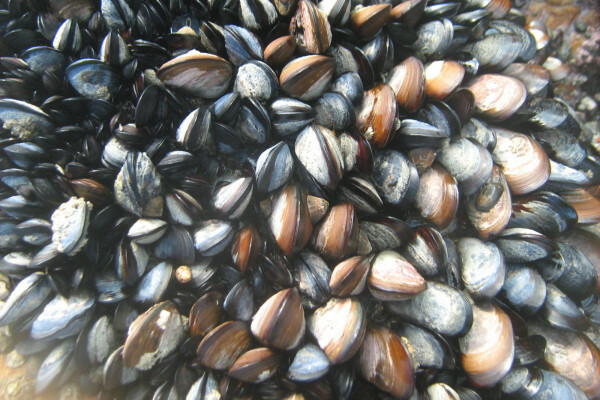 Not only is there an increased surface area on which to settle, which keeps down competition, but sitting near the mussel's siphons - the intake and outflow pipes through which it draws water to filter out microscopic morsels of food - the barnacles also benefit from the delivery of food carried along on the micro-currents. This is one of the closest symbiotic associations seen on rocky shores, but it raises the question of whether the arrangement is a fair one, or actually more of a one way street for the barnacles. Barnacles are the klingons of the marine world and a mussel with one or more of them sticking to its shell incurs increased competion for food and is also subjected to much greater drag as water flows across the uneven-shaped appendages rather than slipping off the normally streamlined shell. This means the mussels must invest more energy in feeding and in growing a better beard or "byssus" of threads to anchor themselves in place. So the overall question is whether or not the barnacles are significantly inconveniencing the mussels? Marine researchers Christian Buschbaum and Bettina Saier believed this was the case after carrying out a study in the Wadden Sea, in Germany, which showed reduced growth of mussels that had barnacles on their shells. But the answer to this question is even more relevant when we're considering the coastal waters of South Africa. Because here an invasive species of blue mussel, Mytilus galloprovincialis, has out-competed the indigenous species that once dominated the west coast. The same story is playing out on the south-east coast where another indigenous mussel species, Perna perna, is being similarly impacted. So the epibiotic (from the Greek 'live ontop') relationship between barnacles and mussels might have a varying impact depending upon the mussel species, and understanding this could help to deal with the invasive blue mussel species. The increased drag caused by epibiotic barnacles is more problematic for invasive blue mussels because they tend to attach themselves less strongly than the indigenous Perna species. So barnacle-infested blue mussels might suffer a higher mortality rate in sites where it is harder to cling on, for instance where the waves and currents are stronger. Already a divide is emerging between the sites where the invasive and native mussels are found. This is caused by both post and pre-settlement factors as well as different growing seasons for the two species. It may be possible to exaggerate this divide but first we need to know just how happily both these mussel species live alongside the barnacles attached to them and whether this epibiotic relationship is one of 'peace and harmony' or reluctant tolerance. But judging the "happiness" of a mussel is not an easy task. Ask them a question and they just "clam up". But there are some physical clues to their fitness, such as growth rates, overall condition, which is estimated from the ratio of dry shell weight to dried soft body weight, as well as the size of barnacles on and off mussels, which can give an indication of their wellbeing. Stressed mussels also produce more "heat shock proteins" (Hsps). These are substances that protect and repair cells damaged by stress (not only heat stress but other physical or chemical stresses), so they can be used as markers to indicate relative levels of stress and to draw comparisons between the well-being of different mussel species. So far we've only considered the barnacles as potential free-loaders. But it's possible thaty they do pay something towards their keep. They equip the mussels they colonise with an effective camouflage suit and also offer enhanced protection from predators and even heat stress. And, if the relationship is a good balance of give and take, it will contribute to a wider network aiming to understand epibiotic relationships. Already similar studies have been conducted considering the impacts of epibionts on their hosts. A study looking at mussels and epibiotic algae has been informative about mussel-dominated shores, while another more specific study looked at macroalgae, urchins, mussels and crabs. It examined how epibionts affect the predator-prey interactions of these species and the consequences for the rest of the community. The findings can also apply to commercial shellfisheries where studies on the epibiotic relationships or 'biofouling' as it can also be known, involve oysters, scallops and gastropods. So, between the implications for biofouling and the consequences for invasive species, there's still a lot to know about epibiosis and understanding the interactions between indigenous mussels, invasive mussels, and their epibiotic barnacles. Previous I'm a Civet: Get me out of here!